It was December 31st of 1996 when I first fell suddenly ill with mononucleosis. I never recovered, and was later diagnosed with the neuro-immune disease myalgic encephalomyelitis (ME). Over time, in large part due to the lack of appropriate medical advice I received those first few years, the illness grew in severity until I collapsed and became mostly bedridden -- so sick that I still can barely speak more than a few words at a time in a voice just slightly above a whisper. As this anniversary approaches and I reflect on so much time lost to this disease, I find myself experiencing a sense of grief over a life not fully lived. Generally, I don't dwell on such things as it is just too overwhelming. As I've mentioned in previous posts, in order to cope with such a degree of loss, I've had to learn to shift my thinking and focus on what things I can accomplish each day, rather than on what I cannot. Living in the moment is the only way to maintain a sense of normalcy, and to find joy in what gifts still remain. But 18 years is a long time to be this sick. It's an entire childhood lived into adulthood. It's nearly two decades of potential life adventures and wonderful memories never experienced and irrevocably lost. Recently, I stumbled upon a blog written by a young woman with severe ME who has spent much of her youth confined to her bed. She was about to celebrate her 30th birthday and she had 30 wishes she wanted her readers to help her fulfill. Most were not wishes she wanted granted for herself, but for others. She wanted you to join the bone marrow register on her behalf, to donate blood, to give to a charity, to sew a blanket for others who are bedbound. As my 18th "sickiversary" approaches this year, I have decided to compile a similar list of my own. They are 18 wishes of sorts. More specifically, they are 18 things I desperately wish I could do, but can't. And while I continue to maintain hope of someday regaining my health and being able to do all the many things I've so longed to do, that day has unfortunately not yet come. So, today, I ask you, if able, to choose just one item from the list and do it for me, as well as for all the others like me who have been bedridden and/or housebound with this disease for far too long. In doing so, you will give this anniversary more meaning, and you will help transform it into a day of wishes fulfilled rather than of wishes lost. It would be an immeasurable gift to me to know even one person had a small moment in their day that was just a little more fulfilling than it might otherwise have been. 1. When you wake in the morning, take a moment to fully savor the feeling of good health. Breathe it in and let yourself feel an overwhelming sense of gratitude for the amazing gift you have been given. 2. When you get up and out of bed, take a moment to marvel at the fact that you can even stand up; that you can walk and freely move your body in whatever ways you wish. 3. Revel in a long, hot shower or bubble bath. 4. Call an old friend on the phone you haven't talked to in awhile and spend some time to catch up on each other's lives. If you don't have time for a long chat, call someone simply to tell them you were thinking of them, and that you love them. 5. Hug a child. If you have children of your own, be sure to take a moment out of your day to hold them close, tell them how much they mean to you, and wonder at the tremendous miracle with which you have been so blessed. If you already do this every day, or even several times a day, do it just once more. 6. Plan a romantic dinner with your significant other. Wear your fanciest dress or favorite outfit for the occasion -- if only because it's fun, and you can. 7. Go for a walk. It could be a stroll in a park, along a beach, in a garden, around your backyard, or even just down the driveway to the mailbox. While doing so, take in the beauty of nature that surrounds you -- the brilliant blue sky, the abundance of trees and the sounds of birds chirping in the air. 8. Exercise. People with ME are unable to do so, often even minimally, without severe repercussions because our bodies simply don't respond appropriately. So, for the millions of us worldwide with this disease who can't do so themselves -- join a gym, ride a bike, head out for a run, go swimming, climb a mountain or do something you love doing that energizes your body, and feel how amazing that sensation can be. 9. Do something from your bucket list; something you've always wanted to do, but have never done before. 10. Sing a song out loud from beginning to end with full gusto, even if you sound horrible. Be grateful you have a voice. 11. Plan an exotic vacation or go on a road trip. 12. Read a book cover-to-cover, watch a movie marathon or go to a theater/concert to see a professional performance. 13. Do something artistic. Paint, draw, sew, dance, write a poem or create something beautiful with your hands. 14. If you have been putting off a doctor's appointment, don't delay any further. Call to have that routine physical, a mammogram or any other test you know needs done, but that you haven't gotten around to yet. 15. Cook a meal for or plan a night out with friends. 16. Simply go to work and be grateful that you can. 17. Do something kind for someone today. This is something I can still do myself, of course, but not to the degree I would like. So, if you can, go out of your way to help make someone's day extra special. It could be a simple random act of kindness, donating to a charity or something more involved like volunteering at a hospital, church or shelter. It doesn't take much to make someone smile and let them know they matter and that their life has value. 18. Try not to complain about the little things. It can be easy to get caught up in the bustle of everyday activity and lose sight of all the amazing things you have right in front of you. If you are in good health, are able to get out of bed each morning, go for a walk, go to school or work, engage with friends and family and the people who love you dearly -- these are the things that matter. If you find yourself agitated or annoyed about something today, remember to take a moment to gain perspective and realize just how fortunate you truly are. Soak in all the goodness in your life and appreciate every precious moment. So much can be lost in an instant, and you won't want to have missed a single second. 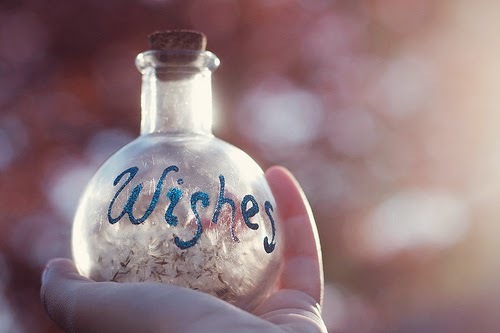 May this New Year allow YOU to do something on your wish list! Love you. Marian said it for me, but I'll also try to hit a few of the things on your list. Laurel, your generous spirit is a marvel. Praying, as always, that your health is restored. I will be mindful in every moment today, just as much as I can. And I will close my eyes and concentrate and send every fresh air- healthy body vibe to you so you will know I tried to enjoy it for you and that I grateful to you for reminding me to enjoy it! You are an inspiration to the rest of us, Laurel - you do number 17 whenever you post on your blog, raising ME awareness and always finding something positive to say despite your situation - thank you. I can't do a lot of the things on your list, but I can go for a walk, read a book from cover to cover, do something artistic, and hopefully do something kind too. I can also sing a song out loud, and since reading your post the other day I have been singing a lot and thinking of you. I hope and pray that one day you'll be able to do at least some of the things on your list too.